Once upon a time, there was a dressmaker who traveled across the ocean to visit her ancestral home… Okay, okay, I won’t going to go any further with the fairytale theme. The castle will do most of the work for me there. 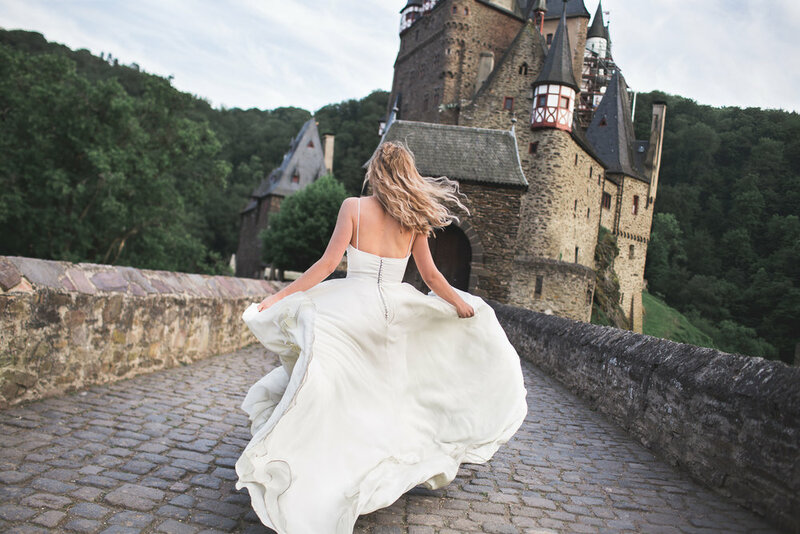 But, it’s true that I ventured off to Wierschem, Germany back in May to capture some magical moments in front of the historic castle, Burg Eltz (Burg means castle). This trip was a little of an origin story for me. As some of you may know, the name Modehaus is German, meaning fashion house. It’s a nod to my roots and it reflects a big part our brand message. We like to do things the old way. All the work to make our garments in done in house. Everything is made with extraordinary care and gowns are made for the individual, not the masses. Fashion houses are still around, but there are fewer and fewer of them now due to our culture of mass production. A little of my backstory: My mother immigrated from Germany when she was a child. She and my Oma moved to South Dakota all the way from Wetzlar, which is in the south-central part of Germany. My husband also grew up in Germany. On the night we met, he drew a map of Germany on a napkin with a tiny line from Wetzlar to the city that he grew up in, Darmstadt. Well folks, I can tell you that it was over right then. Game blouses. Wish I still had that napkin. It was incredible traveling with my husband. We stopped to see his childhood home. The brick with his initials was still there. He drew them when they were repairing the road more than 20 years ago. We spent time with family and soaked up every acre of lush greenness. Naturally, we ate lots of wurst and came home with a suitcase full of chocolate. 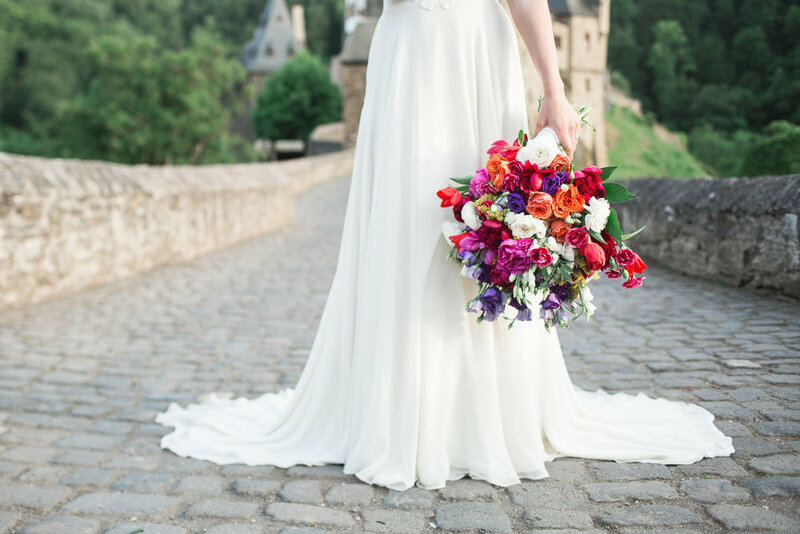 Samantha, of Samantha Lovett photography, specializes in weddings and lives in Germany. (You guessed it, she is my sister-in-law). She shoots all around the world, so a quick drive to Burg Eltz was easy for her. Homegirl ran out of gas on the autobahn about a week earlier when picking me up from the airport, so I did have my doubts about the four-hour journey. The trip was a steep one. My ears were popping as we rolled up the beautiful German countryside and along the Rhein River. There was breathtaking greeness everywhere we looked. On the final climb just before the castle, we were surrounded by forest. The road was right next to the side of the hill with no guard rail. Just as nature intended. I looked down a few times and whew did my stomach drop! The castle seemed to appear out of nowhere through the trees. It was breathtaking. We pulled right up to the ancient stone bridge and jumped out of the car to get started so we could catch the perfect light. It was just peeking through the crest of the hill behind us. Burg Eltz looks so out of time. Built in the 12th century, they are constantly working to preserve it. If you look very closely at some of the images, you can see scaffolding on the side of the castle where they are repairing medieval shingles. But here in the mountains, it’s completely isolated. Looking at it, you forget about the modernity happening just at the bottom of the hill. With our gorgeous bride, Vanda, and a vibrant bouquet designed by Anastasiya’s Blooms, we began our shoot. Get a load of those bright blooms. I am loving the purple, orange, and pops of yellow! Another fan of color, our hair and makeup gave the perfect balance to this look. Sophiamua chose a bold, yet natural smokey eye with deep pinks and purples. A natural lip paired with textured, beachy waves created an effortless look. We had just a few moments to soak up the sun before it disappeared. We did our best to make the most of it. Apart from another photographer there who asked us to watch his stuff for him 🤷, we had the place to ourselves. You could hear the birds chirping and the river bubbling. The Ladonna gown, from our You Are My Muse, Spring ‘18 collection, is a georgette and crepe gown with a lace detail bodice. With elegant minimal spaghetti straps, the neckline flatters showing just enough skin. The low back comes to a closure with real silk-covered, half ball buttons. The hand stitched lace detail adds a soft touch to the front of the gown without stealing the show. This gown is all about balance. The real star of this performance is the bride. We are reminded of that when she moves in this gown. The Ladonna’s skirt has three layers of silk crepe that bounce as Vanda moves. The buttery fabric is light and comes alive with every step. Vanda practiced her Cinderella moment over and over as she ran across the bridge. Samantha and I chased her back and forth hunting for the perfect shot. There are usually one or two VIP shots for every styled shoot. This one was no different. I’ll let you in on the secrets behind our holy grail shot. The bridge leading to the castle is roughly 30 yards long. There were three of us on site for the shoot. My job was to billow the dress. I pride myself in my billowing abilities because let’s be honest, a dressmaker does not do much more on site for a photoshoot. This lady has to have a job. My billowing for this shot required me to squat the length of the bridge and follow Vanda as she walked. All the while I am flapping my elbows like a chicken behind her and making my six-foot self as small as possible. Samantha kinda hopped backward in front of us, keeping Vanda in focus and trying not to fall and break her equipment. Bystanders would have been in for a treat watching us bust-a-gut as we gathered all of our stamina and coordination to capture the shot. With some sweat, scuffed knees, and zero broken lenses, we got the shot. Was I photoshopped out of this image? Maybe. I love her bare feet peeking under the hem and the magical movement of the layers of dress. The sun shining on her face just before it disappears behind the trees. Ok, maybe it was a fairytale moment. Head over to our FB page for some #behindtheseams videos and moments from this fabulous day.